The Thomas Del Mar (24% buyer’s premium) sale in London on December 5 included several excellent pairs of English pistols. A colourful history would appear to lie behind the cased pair of pistols by James Barber of London, 1758. Mounted in silver with flamboyant rococo motifs and with similarly chiselled and gilt decorated barrels signed J Barbar, these guns had been fitted with good quality replacement locks signed Wheeler in c.1830. They sold for £9000. 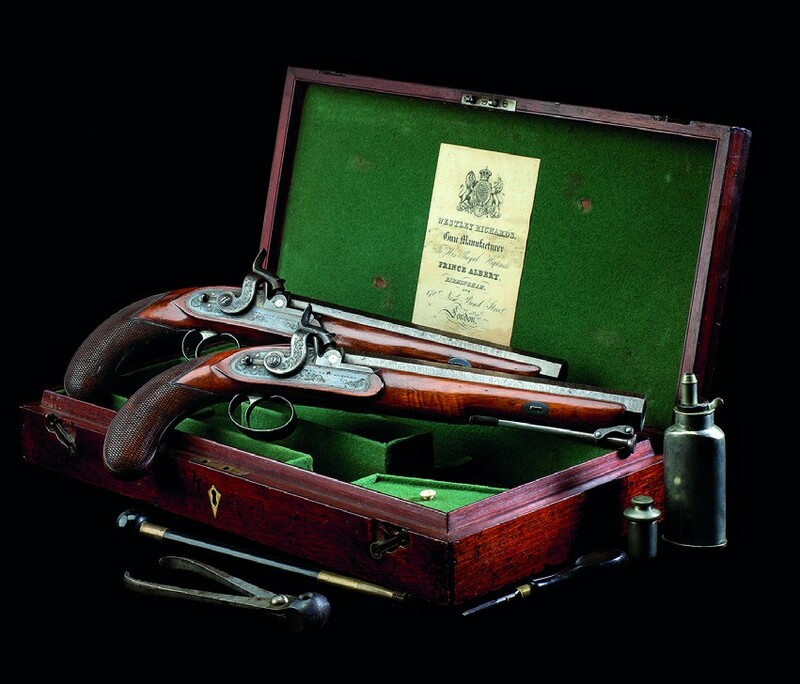 A pair of 16-bore percussion officers’ pistols by Westley Richards of Birmingham (right) were in the crispest condition, probably unfired since they were made in 1840, and still in their original mahogany case with accessories. They also made £9000. The underbidder for the fine pair of Westley Richards percussion pistols sold at Thomas Del Mar in December (see story left) may wish to take a look at this pair of almost identical pistols by the Birmingham maker which is to be offered at Woolley & Wallis in Salisbury on May 1. The underbidder for the fine pair of Westley Richards percussion pistols sold at Thomas Del Mar in December may wish to take a look at this pair of almost identical pistols by the Birmingham maker which is to be offered at Woolley & Wallis in Salisbury on May 1.